HomeConditions & Symptoms FAQWhat is a Hiatal Hernia? Your diaphragm is a muscle above your stomach, and your esophagus passes through an opening (hiatus) in your diaphragm to connect to your stomach. A hiatal hernia occurs when part of your stomach pushes up through the opening. You may not even know this has happened if only a small part of your stomach pokes through, particularly if it quickly returns to its normal position. However, a large or persistent hiatal hernia can allow food and/or acid to back up into your esophagus, causing heartburn and potentially, GERD (gastroesophageal reflux disease). Persistent and intense pressure on the surrounding muscles. This can be caused by coughing, vomiting, straining during a bowel movement, heavy lifting or pregnancy. Weakening of the diaphragm due to age or pregnancy. A sliding hiatal hernia, which is the more common type, occurs when the stomach and conjoining section of esophagus push up through the hiatus. A paraesophageal hernia occurs when a portion of the stomach pushes up through the hiatus to sit beside the esophagus. This type of hiatal hernia is rarer but potentially more dangerous, as the portion of the stomach can become trapped and ‘strangled’, losing its blood supply. 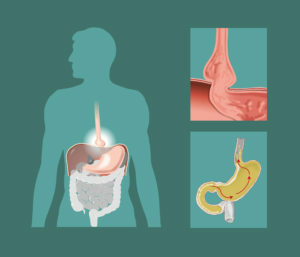 Surgery is not always performed unless there is a danger of damage to the stomach or esophagus, but it may be considered if GERD symptoms or pain are severe. Medications to reduce acid reflux, such as proton pump inhibitors, antacids and H2 blockers, are normally used to alleviate symptoms. If surgery is required, the primary technique used is fundoplication, which is usually done laparoscopically (i.e. through small slits in the abdomen rather than through a large incision). During this procedure, the upper part of your stomach is wrapped right around the lower end of the esophagus and fixed in place, strengthening the LES (lower esophageal sphincter). This can be successful, but some people may need to have the surgery repeated later.